June 6, 1944: the beginning of the end for Nazi Germany. 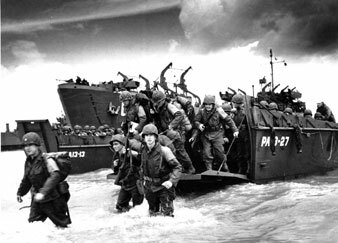 American reinforcements, arrive on the beaches of Normandy. This article appeared in the June 17, 1944 edition of The Nation. D-Day was hailed with a sense of relief all over the -world, but people were quick to realize that a new period of tension lay ahead. Now we must wait again, keeping our nerves under control, for indications that the invasion has succeeded. According to Arthur Krock of the New York Times, the High Command expects a lapse of four to five weeks before any conclusive verdict on General Eisenhower’s operations can be given. By that time the whole design of the grand strategy decided on at the Teheran conference may have emerged. For it must not be forgotten that the landings in France are not an isolated event. They are linked closely to the drive in Italy, which is developing with such success, to the campaign of Marshal Tito, which may be supplemented by Allied operations in the Balkans, and, finally but most important of all, to the new blows which the Red Army has begun to deliver on the eastern front. In the immediate future we can expect plenty of colorful details of the fighting but little news of the kind that will enable us to assess its progress. There will be no release from Allied headquarters of any information that could possibly help the enemy. This involves a risk that the public will pay too much attention to the artfully concocted mixture of fact and fancy that Goebbels is serving in generous portions. We can only hope that the press will be careful in handling stories from this source. It was unfortunate, to say the least, that the fall of Caen was headlined on a German say-so when next day the papers had to admit that the battle for the town continued. The broad outline of General Eisenhower’s strategy became clear as soon as the location of the first landings were known. It was based upon the geography of the Cotentin Peninsula, which sticks into the English Channel like a raised thumb. At its northern tip, less than ninety miles from the nearest point of the English coast, is the well-equipped deep-water port of Cherbourg. The shores of the peninsula are rocky and unsuitable for landing craft but immediately to the east are the wide sandy beaches of the Bay of the Seine. Here the chief landing—to date—was made and a beachhead established cutting the main road and rail communications of Cherbourg. At the same time the peninsula itself was saturated with Allied parachutists whose apparent objective was to isolate Cherbourg and prevent any Nazi reinforcements from reaching it. If this port can be captured the first essential for the deep penetration of France—a good supply base where heavy equipment can be landed—will have been secured. Our successes in taking the Normandy beaches proved that a certain amount of bluff had been mixed with the concrete of the Atlantic Wall. In places the first echelons ashore encountered fierce resistance and suffered heavy casualties, but the fixed defenses proved much less formidable than Nazi propaganda had suggested. This does not mean, however, that Marshals Rundstedt and Rommel have shot their bolt. Whatever Goebbels may have said, they have known all along that they could not stop an invasion on the beaches, and accordingly they have concentrated their best troops well inland as a mobile, strategic reserve to be hurled at the Allies once it is clear where the main line of attack is developing. The next crisis of the invasion, which may come before these words appear in print, will arise when this élite German force is put in motion. However, Rommel must be sure that Normandy is really the danger point before he can afford to counter-attack there. He knows that only a fraction of General Eisenhower’s forces are engaged so far, and the Allied warning to fishermen from Norway to the Pyrenees to stay in port suggests that new landings are contemplated. But while the Nazi generals wait, the Allied bridgeheads grow stronger. Moreover, the American and British air forces are busy sweeping a wide arc south of the Channel, bombing and shooting up everything German that moves on rail or road, attacking bridges, marshaling yards, stations, barracks, and supply dumps. This war of attrition from the air, together with that carried on by the underground, must be reducing both the mobility and the potential striking power of the Nazi strategic reserve. Yet in the opening stages of the invasion there was little sign of counter-measures by the Luftwaffe. In the first two and a half days of the invasion Allied planes flew 27,000 sorties with a loss of little more than 1 per cent. What remains of the Luftwaffe is being hoarded, perhaps for a blow to be synchronized with Rommel’s counterattack. The dilemma of the German western command is but one phase of the total dilemma which total warfare has become for Hitler. Now his old nightmare has become grim reality. Germany is encircled, forced to fight not merely on two but on four fronts. Indeed, we may say on five, for while external foes batter down the walls of Fortress Europe, unarmed but increasingly formidable enemies fight within its gates. The strength Hitler commands is still great but not great enough to beat all his challengers at once. Where, then, shall he throw his reserves? Into the western breach and have nothing left to bolster the east when the Red Army strikes? Or must he stem the Russian tide at all costs even though it means opening a path to the Rhine? Again, how far can he strip his home garrisons when Germany harbors ten million foreign slaves waiting a chance to break their bonds? Facing defeat, Hitler will fight hard and cunningly. We must be prepared to withstand hard knocks, to suffer setbacks, to avoid diplomatic booby traps. But we have arrived at the beginning of the end, and only a suicidal disruption of the United Nations can rob us of victory.